Here is page 01 of Mission 001: Mexican Standoff! This first page was drawn as a stand alone joke and at first was not intended to be turned into a comic. It was going to be just a funny doodle that I passed around to my close friends that might get a kick out of it. My friends and family enjoyed it enough for them to demand a second page. It just happened that at the same time this picture was getting passed around that a really close friend of mine and a founding member of Team Stryker was getting married. I gave myself the deadline of completing an entire issue of Team Stryker to give to him as a wedding gift (along with His and Hers Team Stryker t-shirts). 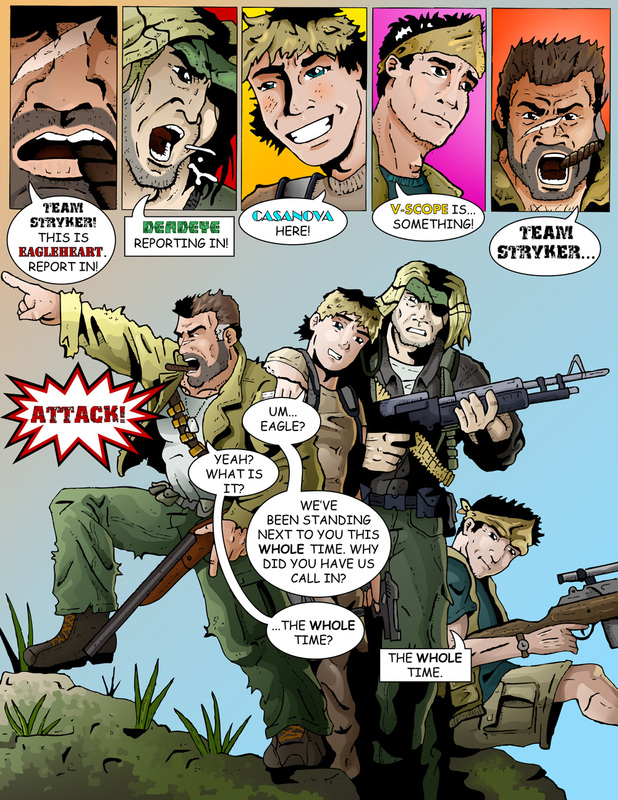 Since then I have drawn three full missions of Team Stryker (each longer than the last) and have moved on to coloring them for the amusement of all the Team Stryker fans out there. While I know there are many web comics out there I have yet to find one that is a web comic that wants to be a fully fledged comic that you would find on the shelves of your local comic store and that is exactly what Team Stryker wants to be. There are covers, stories, arcs, recurring characters and progression not found in most web comics. With each page I plan to write about the page, my process and myself. With Team Stryker there is always a new story to tell and something new to see.